One piece 316/316L S/S Construction for most pressures. For use with unique Hoffer high pressure 316/316L or carbon steel mating flange kits, supplied complete with SAE J429 Grade 8 high yield strength bolts and “O” rings. Operate over a wide range of temperatures. Sizes 1/4″ through 2″. Pressure ratings of 3,000, 6,000, 8,000, and 10,000 psi available for most sizes. Larger sizes and pressures available upon request. Contact factory. 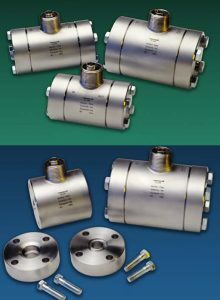 for extended temperature range applications. Bearing Styles: Ceramic hybrid ball bearings, sleeve bearings in tungsten carbide and hard carbon composite are available. Materials: 316 stainless steel standard. Consult with applications group for corrosive applications. Broad material list available.